Workman Publishing Company, 9780761167822, 256pp. 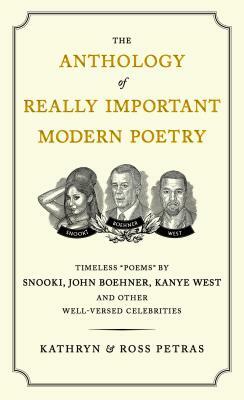 With their great gift for curating the inane public utterances of celebrities, politicians, and other self-important loudmouths, Kathryn and Ross Petras offer a timeless collection of “found” poetry—real quotes formatted as verse for hilarious and surprising effect. The quotes are inherently addictive and funny—but turning them into verse intensifies the effect, making the words even more ridiculous, parodies to revel in. And the Petrases take it one step further: organizing the poems by themes, introducing each work with a Norton Anthology mock seriousness, discussing “schools,” and larding the text with footnotes, The Anthology of Really Important Modern Poetry is pure deadpan pleasure. A whiff of Emily Dickinson in Ann Coulter? It’s literary treasure, right under our noses.